The grey squirrel- victim of circumstance?If so, then this conspiracy must extend to British legal provisions and EU directives both listing the grey squirrel as an invader to be controlled, right? Well, no – put this argument to the test and you’ll see that the facts actually do stack up against the grey squirrel. The reality is that, while the grey squirrel is an important part of North American forest ecosystems, since being brought to Europe by the Victorians in 1876, the animal has had severe ecological and economic impacts on British woodlands. Red and grey meet on the battleground. 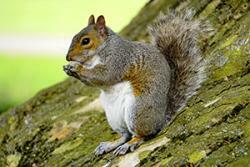 : David Bailey- author providedToday there are approximately 2.5m grey squirrels in Britain, but less than 140,000 reds. 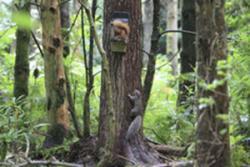 Grey squirrels out-compete native reds for food and space. They also dig up and consume seed that red squirrels have buried as a winter store. This behaviour reduces red squirrel skeletal growth rates and adult size, and greatly depresses juvenile survival rates too. Even songbirds are affected by grey squirrels. A recent study gave evidence of negative association between woodland songbird fledging rates and presence of grey squirrels – though it must be noted that this was not observed annually and only seen on some of the sites studied. Earlier studies didn’t find evidence to indicate greys affect bird population, but also didn’t exclude the possibility – even for bird species whose population is increasing overall.